Can I play Frisbee in the park with my Siberian Husky? Siberian Huskies should never be trusted off-lead. They will run and they won't come back when you call them. Don't be fooled into thinking that you can train them to stay in your yard. The many people who have tried and no longer have their dogs can attest to the risk associated with this impossible task. How should I fence in my yard for my Husky? Siberians are escape artists. Siberians need a SECURELY fenced-in yard if you want to let them off a leash. Over: They can jump or climb most fenced-in areas. Six feet is the recommended height. If your dog is a climber, you may need a roof for your 'kennel'. Under: They will also very easily dig out underneath the fence, so it is recommended that if the fence is not placed upon concrete then something should be buried along the perimeter of the fence in order to properly contain them. Through: Leaving them in a yard or kennel unattended for great lengths is not appropriate for this breed as they are highly intelligent and they WILL find a way out. If the fence is made of a weak gauge of chain link that isn't securely attached, they can push the fence up or chew through it. This can also occur with wood. No other alternatives: Because they are sled pullers, tying out your Siberian is not appropriate as not only will it escape, other neighborhood dogs then have open access to him/her. Your dog is a social animal and wants to be with you. Underground or 'invisible' fences are also not effective for this breed. These dogs learn very quickly that with a good running start, they can get past the range of the fence. Additionally, their thick fur interferes with the effectiveness of the collars. Is it true that Siberians dig holes and shed? They instinctively dig and will leave large holes, even trenches, throughout your yard. Do you own a good vacuum? Twice a year, Siberians do what is referred to as "blowing coat" where they lose their bottom layer of fur, or undercoat. It is a mess! It generally takes at least a week, sometimes more, for all of the fur to leave the coat. You could brush the dog from sunup until sundown and the fur would still be coming out. This is not an exaggeration. When a Siberian is not “blowing coat,” the amount of shedding is minimal to moderate, depending on the climate. Are Siberians high energy dogs? Yes and No. Each dog is an individual and energy levels vary, but as a general rule, they do have lots of energy. If you do not give them enough mental and physical exercise they will become hyperactive. This is a high energy breed, especially for the first two years of life. They are not usually suited for people who won't provide any exercise opportunities for the dog or leave them in a crate for long periods of time. Crate training is recommended both for the safety of your home, but also for the safety of the puppy; however, if your work schedule has you away from the house for much more than 8 hours a day, you will come home to a very anxious puppy! Will my Siberian listen to me? Because the Siberian is a pack animal, it will establish a hierarchy, or 'pecking order' for dominance. Puppy kindergarten classes and general obedience classes are highly recommended for proper socialization and training. 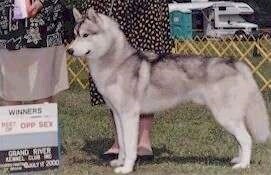 Consistency with training is extremely important or a Siberian will walk all over you. Siberians should be outgoing and friendly. Proper socialization and training should help to ensure that your puppy or dog learns manners. People who have owned a Siberian are typically familiar with the saying, "Being Owned by a Siberian." Allowing a dog to "own" you is NOT recommended. Be sure to be your dog’s Pack Leader! Will my Siberian get along with other dogs or my cat? This breed has a high predatory instinct and will hunt cats, birds and other smaller animals. Sometimes, when a Siberian is raised with a cat, owners have had success with this integration; however, in most cases when an older Siberian is introduced to a home with a cat, the Siberian cannot be trusted. Every dog is different, so it is difficult to generalize concerning their adaptability with other dogs. Their ability to get along with other dogs, as with any breed of dog, also stems back to their level of dominance and 'status' within the hierarchy. Yes, Siberians are good with children; however, as with any breed, they must be taught to respect children and view them as being 'above' themselves in their hierarchy or pecking order. Do Siberians make good watchdogs? No, Siberians are social and outgoing. They do not bark much, although they will howl. Siberians are generally very easy-keepers and do not require much food. They were bred for sprint-racing and traveling long distances as working dogs using little food.